I saw this on the way to work yesterday. In a few seconds my mind ran the gambit of… do I stop and take the image and be even later than I already am or is it one of those that got a way and I can remember it as the signature shot that could have been… I stopped. Even though it is not the shot I thought I had when I took it I still like the looks of it. I only took three shots so I wasn’t that much later. People kid me all the time about the amount of photography equipment I bring with me every day. 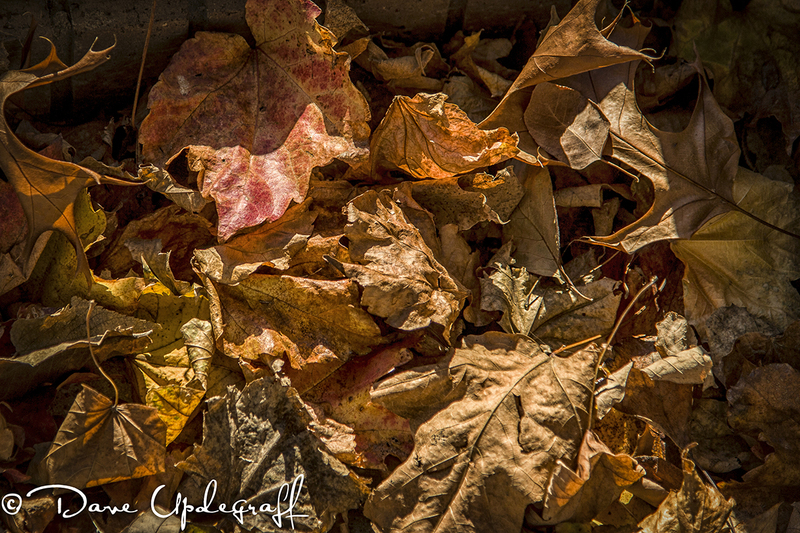 Photography is one of the three passions I have in my life. If it were just a hobby or a matter of liking to take pictures then a single camera in a small bag would do. But I try to capture the very best image possible with every shot I take. Not knowing what that shot may require I bring the entire kitchen sink with me. Weird I know but that’s the way I’m wired. I didn’t have a meeting yesterday so I grabbed a Subway and went hunting for something. This old barn was sitting off the road in a field. There is a small stream that runs in front of the barn and wanders down to the roadway. I tried to get that stream in the image and as a result my angle in relation to the light was not the best. Had I been able to climb the fence and walk closer I could have gotten a better shot. But since I was wearing a suit and it would have been trespassing (there were signs) I opted for this shot even though it’s not what I wanted. Jeanne fully expects to get the call someday that I’ve been found at the bottom of a ravine and there doesn’t seem to be any reason why my car would have traveled down there. 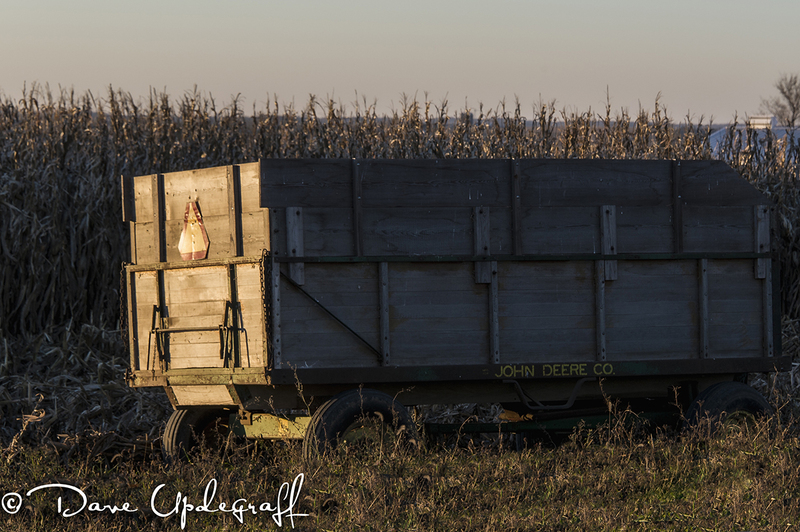 I was coming around a tight curve and saw this old John Deer wagon sitting in the field with the last remnants of sunlight shining on one side of it. Never mind that I ended up on the wrong side of the road before I looked back at what I was doing. 🙂 Anyway I turned around and captured this look. That’s it for today. This is the first time since I started the blog two years ago that I’ve posted something every day of the month. Doesn’t sound like much but it was my goal to post everyday in October. I don’t take many days off but I’ve found that occasionally on a weekend it’s nice to have a day off. Anyway, thanks for sticking with me. 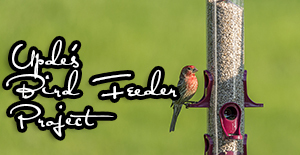 If no one was reading the blog I’d stop and I don’t want to stop so you have to keep reading. Please. 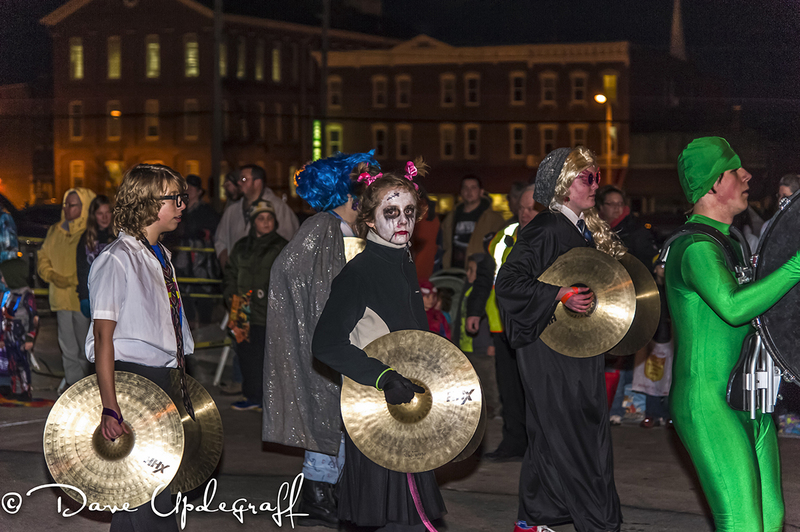 Jeanne and I attended the Dubuque annual Halloween parade yesterday evening. Angie and Ben were taking Joshua and it had been years since I had attended the parade so it sounded like fun. The parade started at 6:30 pm and I didn’t get home until 6:05 pm so we had to hustle to get there before it started. The parade was amazing. It was an hour and a half long with 4 bands and I don’t know how many floats plus all the assorted weird vehicles and walkers. Above Joshua is waiting in anticipation for the parade to start. He could see the flashing lights and every once in a while hear a siren blow. He was excited. It was neat to see the bands last night. The kids all got to dress up and instead of a regimented march they danced and skipped to the cadence. 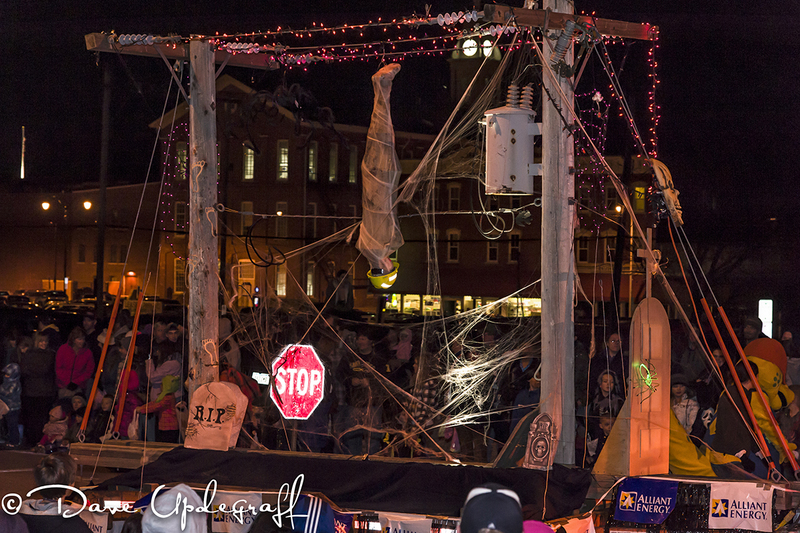 When we arrived at 12th and Main Street it was packed. The people were 4 to 5 people deep along the parade route. There were more people at the parade then at the Labor Day Parade last year. The police were patrolling the parade route on bicycles in a futile attempt to keep people back on the curb. There were some spectacular looking floats including a Pirates of The Caribbean complete with Captain Jack Sparrow, his ship and Davey Jones. Unfortunately I was in a place where about all I could get of the ship was the back of people’s heads. 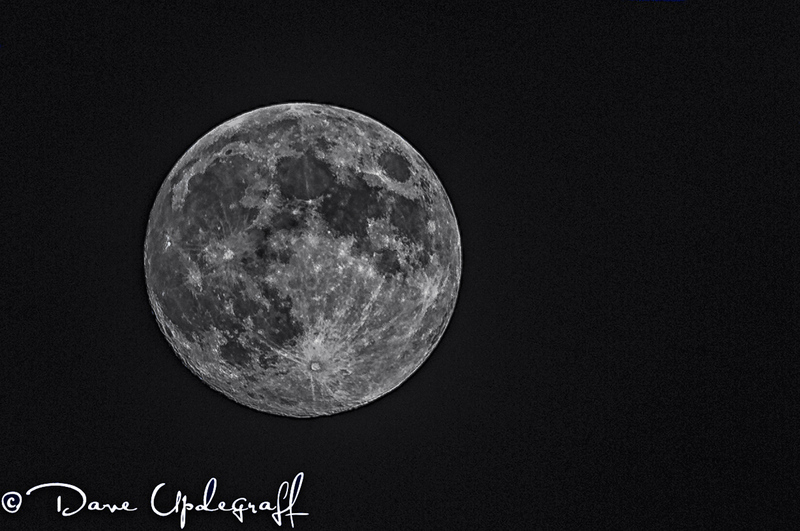 I’ll do some more processing this evening and see if I can salvage something. Joshua had a wonderful time with all the lights and sounds. 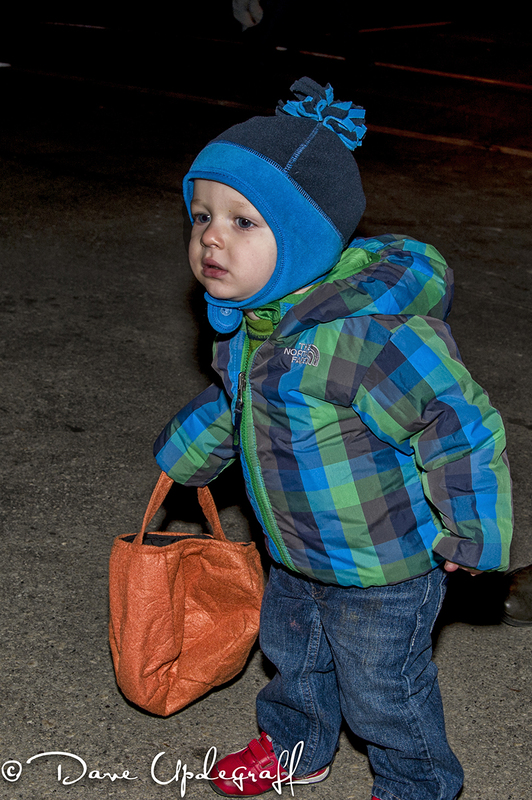 He was so excited and he didn’t want to leave when the parade was over. I on the other had couldn’t wait. It was cold and I was tired of standing on the cold concrete. Plus I felt like I had smoked a pack of cigarettes. Even though we were outside there were enough people smoking that you could smell it constantly. Well that’s it for today. I hope you enjoy your Tuesday. We say a prayer for the people on the East Coast and what they are going through right now. Thanks for stopping by and be careful. Good Monday Greetings. I spent a fair amount of yesterday processing my restaurant shoot from Saturday. Bill Fortney says there are wonderful images all around you. One only needs to open one’s mind to see them. 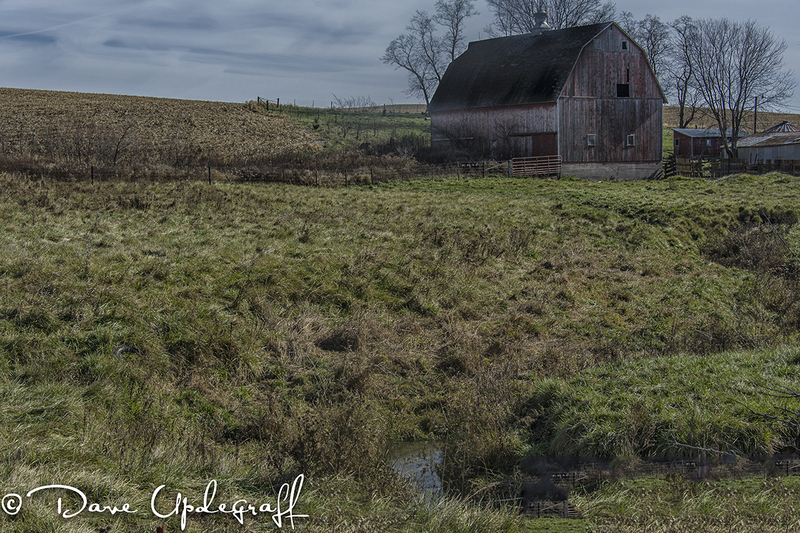 I’ll admit that I get in to a “farm scene” mentality and consequently that is what I tend to see and shoot, especially this time of year. Another nail? Perhaps, however even though it is a gate to a farm field, it is a gate that leads nowhere. At sometime this land may have served a purpose, now it is heavily overgrown with small trees and thick brush. I really enjoy driving the back roads and looking at all the farms. Much of the land is barren now. Crops harvested and some ground even tilled a bit. Many farmers have injected fertilizer into their fields preparing them for their Winter’s sleep. 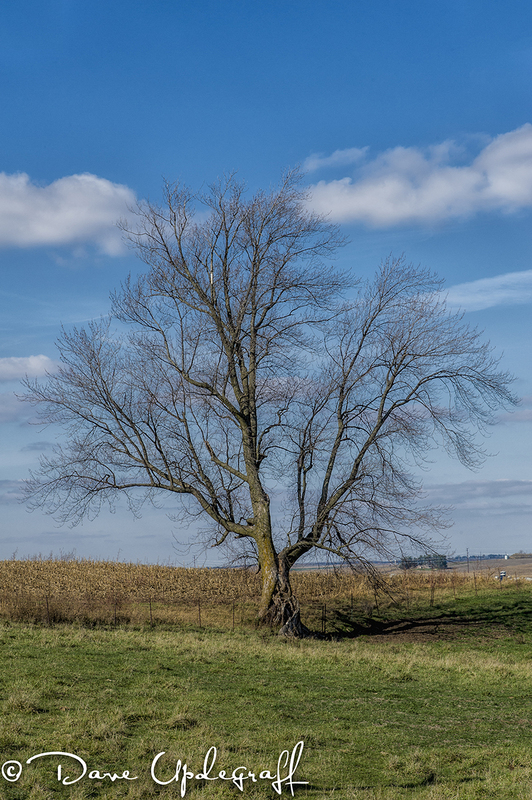 Another sign of late Fall, a mighty tree stands naked in a field. I would imagine this three had some colorful leaves a couple of short weeks ago, now it too settles in for the coming of Winter. 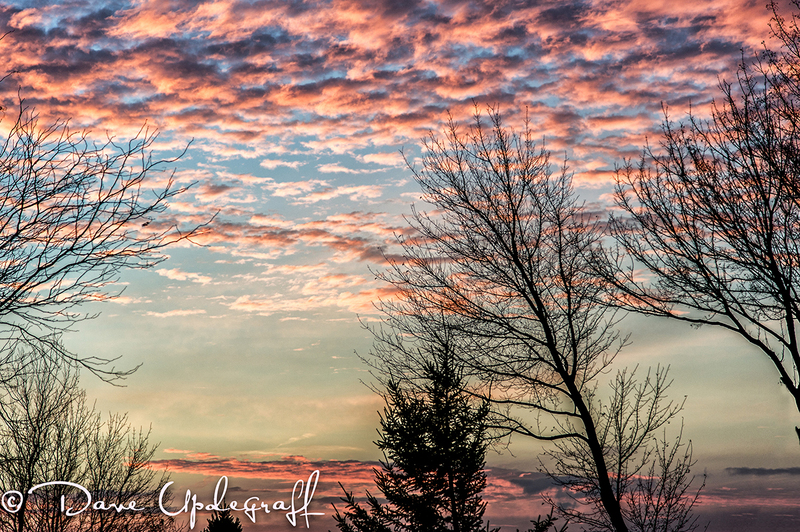 Jeanne’s first thought will be that I enhanced the sky in this image. I adjusted the contrast a bit to give structure to the clouds but I didn’t alter the color nor depth of the sky. It was that deep blue color Saturday late afternoon. That’s it for today. Enjoy your Monday. Unlike some folks most of us have to report for duty today. Hope to have more for you tomorrow. Thanks for stopping by and be careful. I don’t normally think of photography as being hard work. Sure there is some effort involved in getting the shot you want and then in the processing but I do not consider that work. Yesterday however I experienced photography as hard work. Yesterday I loaded up my stuff and drove down to Maquoketa. I arrived about 10:00 am and started unloading. The restaurant was warm (probably not to most people.) So by the time I got the lights, camera, stands, others things in I was really warm. 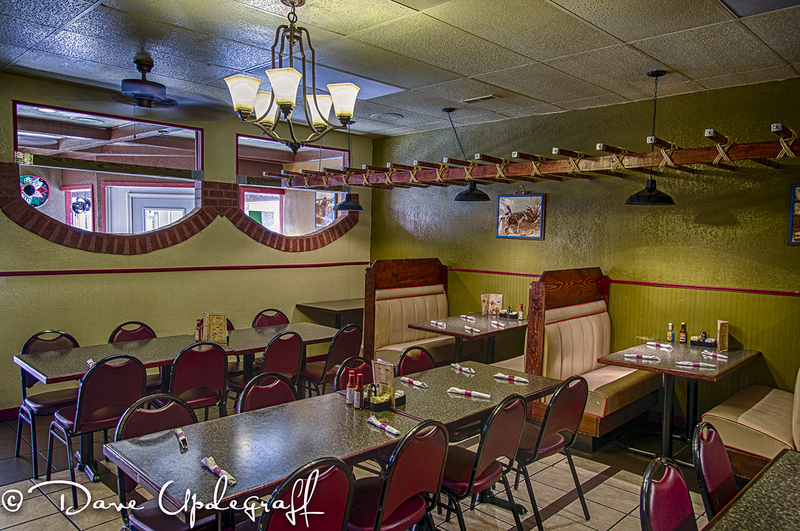 I took about 100 images of the interior of the restaurant. I tried a few in natural light and with strobes but I didn’t like any of them. 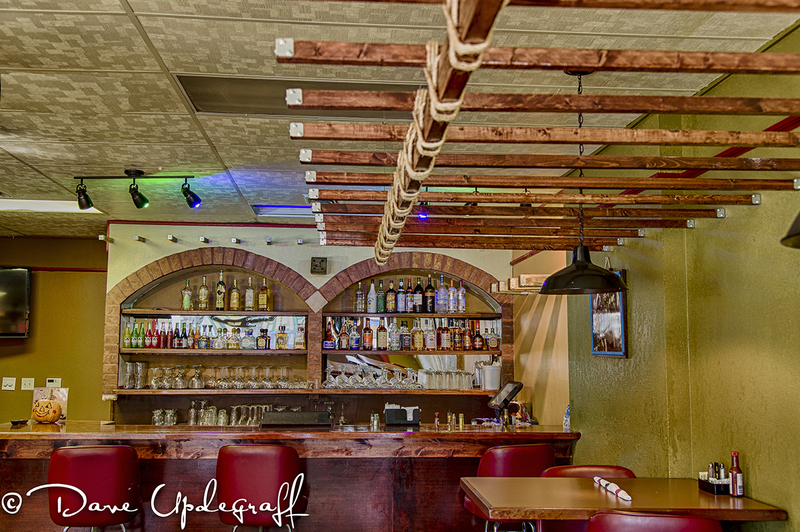 I then decided to shoot all the interior shots in a 5 shot HDR group. I liked the way they came out. So I’m trying to take the interior of the restaurant, some of the patrons who were okay with their picture being taken, some of the food being served, the owner, and trying to capture the ambiance of the place all the while trying to stay out of everyone’s way so they could serve their customers. Of course the more people who came into the restaurant the warmer it got. I had two fans (which I always carry with my lights) going but I wasn’t usually standing in front of them so they didn’t help much. Still it was my first “commercial” shoot and I learned many lessons. I had taken a couple of on-line lessons about shooting a business. It certainly helped but as with all things there is no better teacher than practical experience. One of the challenges I face is a language barrier. The owner doesn’t speak or understand much English. She does pretty good but there is a lot of puzzled looks when we’re trying to communicate. 🙂 She is a very nice lady so that makes it easier to struggle through the language. I finally rolled out of there about 3:30 pm and I was tired. I didn’t even stop for lunch and there were plenty of offers for food but there just wasn’t enough time. Even with all the shots I got as I’m thinking through the layout of the website I know I’m going to have to get some more images that I didn’t get yesterday. Enjoy your Sunday. Looks like it will be a nice one. Thanks for stopping by and be careful. An interesting day, yesterday (photography wise.) I had several Ambassador calls (Chamber) to make yesterday and I decided to take my camera along. Normally I do not because there is a photographer from the newspaper that goes along and takes a picture of the Ambassadors greeting the business owner. It is a nice feature of the Chamber. So while others were looking around the business (waiting for the official greeting) I wandered around shooting things that interested me. One such item was this guy. 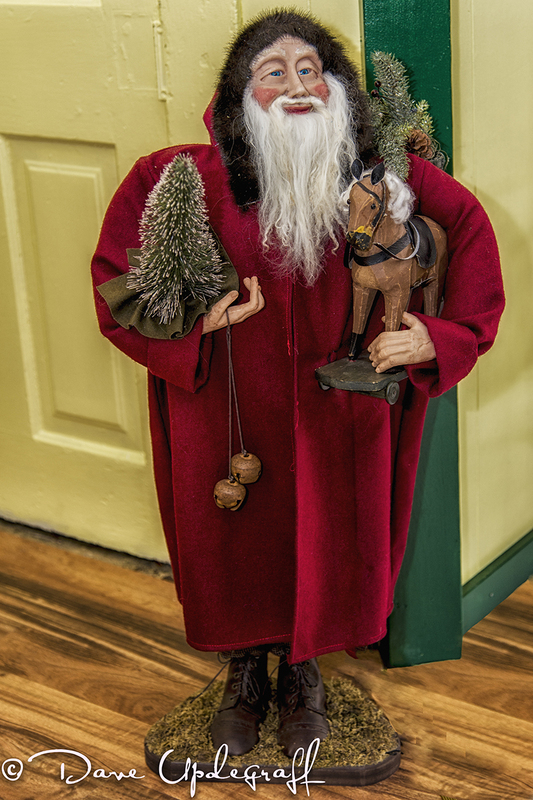 I thought someone will have that in their home of office before the end of Christmas. I’ll check back with the store to see if I’m correct. The next business we welcomed was a restaurant that was celebrating their reopening after a devastating fire a few months ago. It is a popular restaurant in Maquoketa and we all missed having it open. 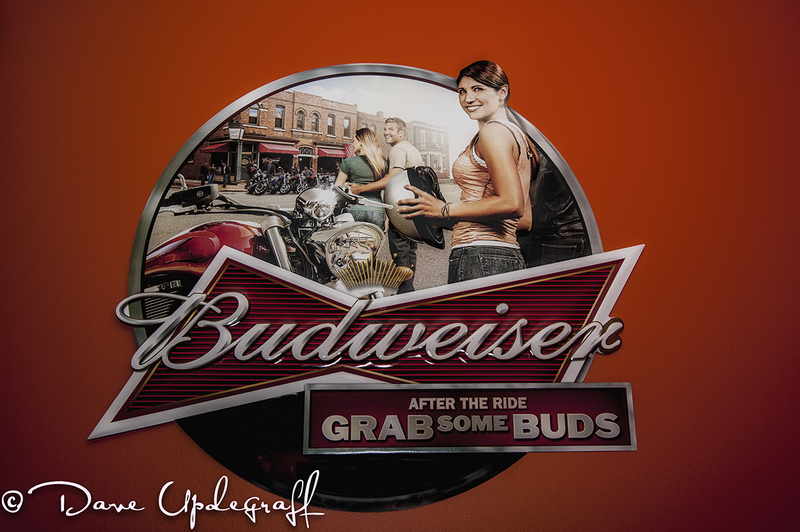 They did a complete refit and everything in the restaurant is brand new even this beverage sign. I took a lot of photos at two of the places we went. I’ll show some of those in later posts (when there is nothing else to show) 🙂 The other business we attended was a new dog grooming and boarding business. Nothing to take images of there. A good friend of mine and I went to lunch yesterday and I wanted to take a picture of a sign on the way to where we were going to eat so I took my camera along. When we were on our way back I saw this large spider web with an intricate design and I shot several images of that for my photo of the day. I took a new road home last night. Well actually if I had stayed on this road I would have never gotten home. I was about 45 minutes longer than I normally am as a result of this “slight” detour. But it was sunny and there were some great clouds around so I wanted to see what I could find. 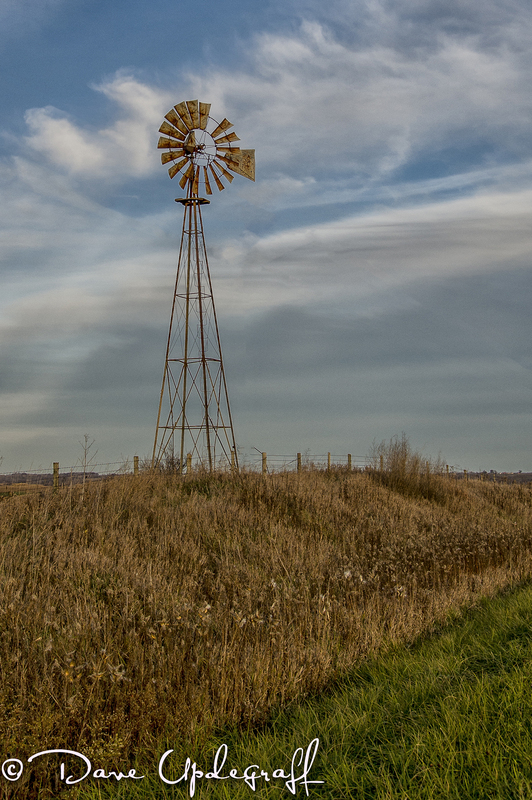 This is not the windmill I usually shoot but when I drove past it I knew I had to shoot it. Fortunately the road was level and there was a good line of sight because there was no shoulder to pull off on so I just put the flashers on and shot away. There was only one vehicle that went by (an older couple) and I could just hear them saying, “Well that’s pathetic, stopped right here in the middle of the road taking a picture of a windmill.” 🙂 Yep, that would be me. Thanks for stopping by. Enjoy your Saturday. 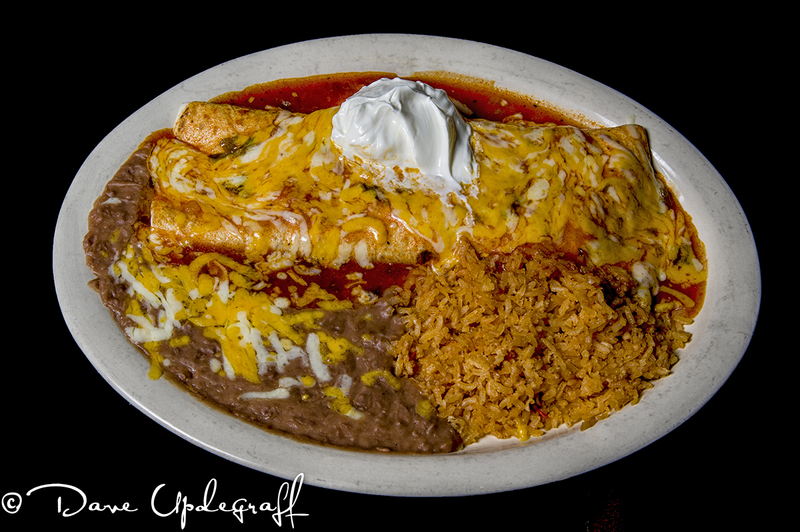 I’m spending most of the day at La Casa De Pancho Restaurant photographing the interior of the restaurant and shooting some of the menu items. Be careful. The things I won’t do to present an image for you. I was flossing my teeth yesterday morning and just happened to look out the window. The sun was just coming up and what it was doing to the clouds was just amazing. I knew if I waited until I finished and put clothes on it would be gone so risking being arrested for indecent exposure (I did have shorts on) I leaned out of the patio door and captured this beautiful gift from God. What a sky. 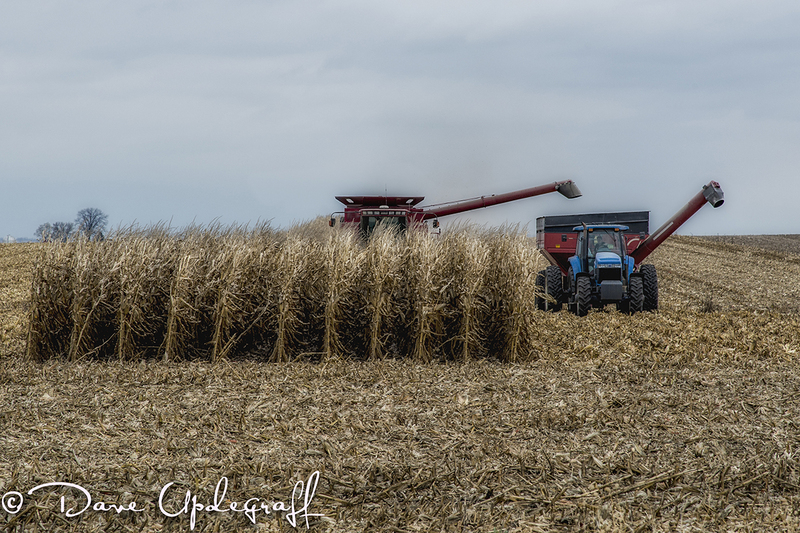 I’m sure some are getting tired of all the harvest images and I understand that. It is the most prevalent thing to shoot these days. All the leaves are gone or most of them are. 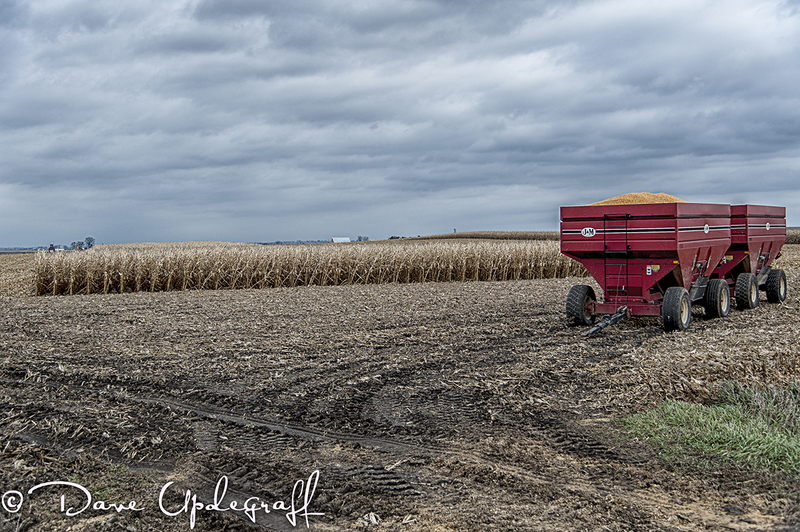 A significant amount of the crops are out of the field so there won’t be too many more of these types of images. I had to go to Clinton today for a meeting. I always take my camera with me whenever I can. So even though the weather was turning rapidly I decided to take it with me. The image above and the one below are the only images I was able to capture from the trip. It turned windy, cloudy, and rained most of the way over and back so there wasn’t any opportunity to capture anything. Hard to believe that October is almost over, yet there was a big Christmas commercial (for Target) already playing as I watched the news yesterday morning. I know they no longer wait for Thanksgiving but I thought they use to wait until Halloween was at least over. That’s it for today. I hope you have a great Friday. I get to wear jeans tomorrow in recognition to breast cancer awareness month. Many of the communities have had theme days this month to raise money and awareness of this disease. 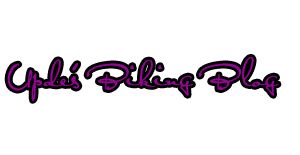 Thank you for checking out the blog today. Be careful. 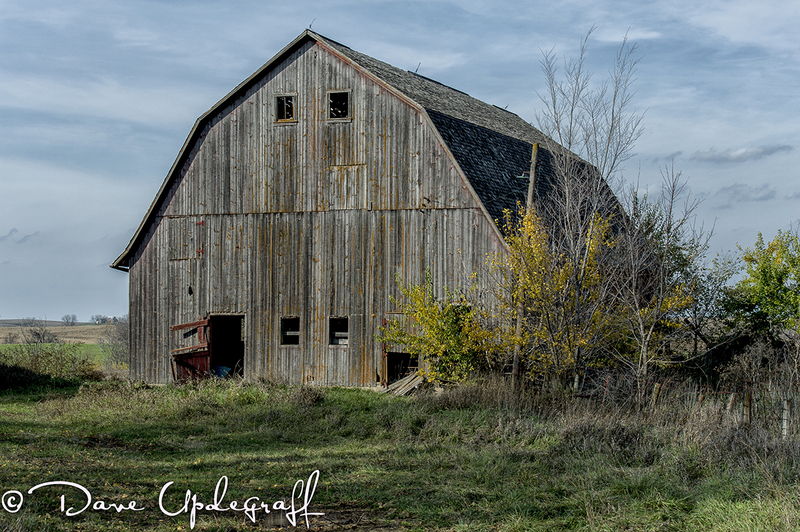 This is one of my favorite old barns. 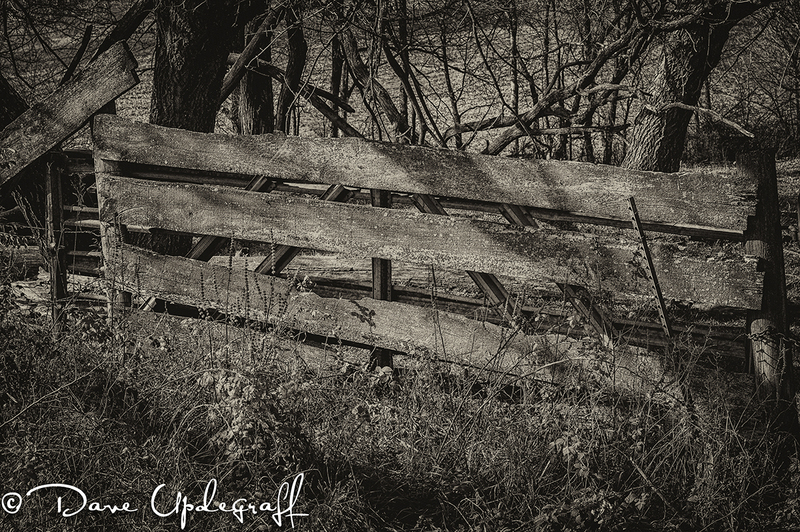 It sits on Highway 64 West of Maquoketa and on my way back from Cedar Rapids yesterday I decided to photograph it again. 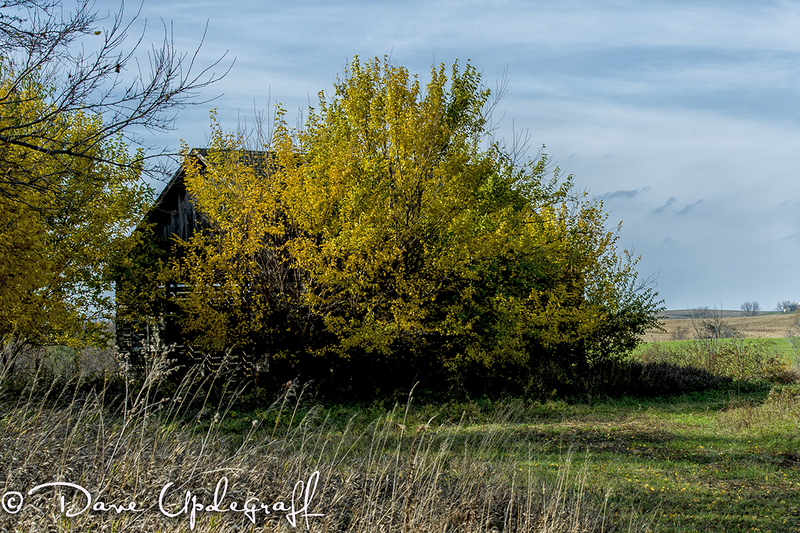 The sky was nice and I enjoy taking pictures of old barns. I only made a few images as I had a meeting to get back for. 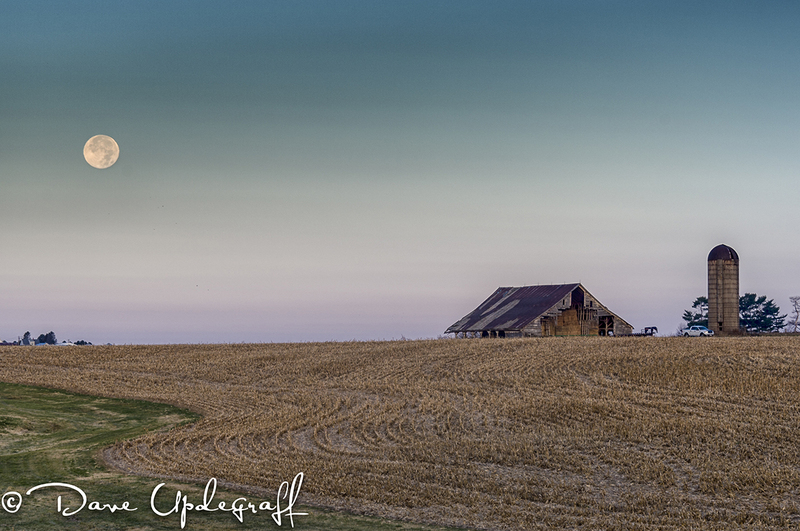 I haven’t shot this barn in the Winter and I think I will do that this Winter if possible. I think this barn would look great in a Winter setting. I started to get back in the car noticed this small tree still have some of its Fall colors on it. It has pretty much taken over this small shed but I liked the looks of this in my view finder so thought I would show it to you. I always enjoy going to Cedar Rapids. We have some wonderful individuals that work there and I enjoy spending some time with them. My favorite camera store is also in Cedar Rapids and I always try to stop by and just say hi to the owner. He is a great guy and very caring individual. His name is Dave Johnson and he owns and runs Pro Photo on Collins Road. I highly recommend him for all your photography needs. Funny thing is I couldn’t tell if all of them were real. 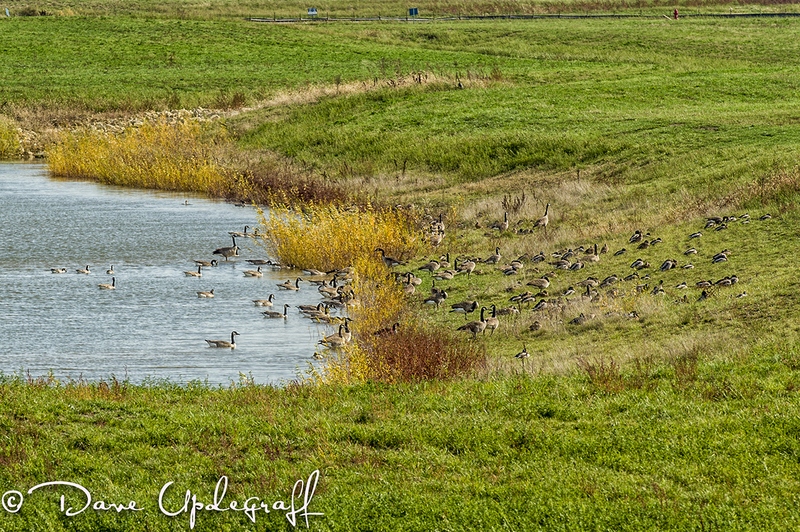 By that I mean I watched this scene for several minutes and although there was some movement there were some geese that were in a strange configuration which they held the entire time I was there. That’s it for today. Enjoy your Thursday and make it a great one. Thanks for stopping by and be careful.